Launched: 2 February 2014. Last updated: 16 June 2015. Accessed at least times since 1 February 2014. Alternative E-mail: rob@rs41.org Download a printable one-page flyer. Yes, against my better judgment, we're now on Facebook. 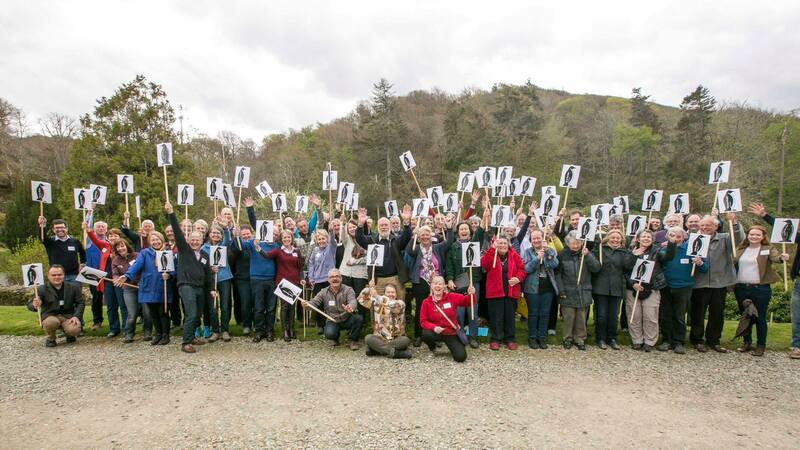 Here's the group photograph taken by Cathy Cooper. taken by Brad Borkan, Cathy Cooper, Rick Dehmel, David Hirzel, Valerie Kerr, Beth Fitzsimmons and Rob Stephenson. When: Friday - Monday, 1-4 May 2015. Where: Craobh Haven, Argyll, Scotland. Organizers/Sponsors: The Antarctic Circle (Robert Stephenson, Coordinator) and Falcon Scott. We welcome co-sponsors. Their donations will help the SouthPole-sium break even! Contact antarctic-circle@comcast.net if you are interested in helping out. 95% Antarctic (pressure from bi-polar bibliophiles has led to the insertion of a minuscule window for Arcticana, preferably tied-in somehow with the Antarctic). Concept: The SouthPole-sium is being organized as an informal and enjoyable opportunity for those interested or involved in the Subject Focus (see above) to come together, meet one another, trade ideas and pursue common interests. In other words, the SouthPole-sium will be something of an extended "bull session," social hour, and networking opportunity. Approach: All attendees will be encouraged to participate, either by giving short (15 minute) presentations on their subject(s) of interest or by actively participating in the discussions or by generally helping out in the running of the event. Although a bit unstructured this seemed to work well in Jaffrey. Any attendee reading a paper will be sent packing! Those wishing to make presentations should contact the Coordinator. This time around we will ask several attendees to organize ahead of time some talks around some common subject thread and to moderate the resulting sessions (see below 'Volunteer Opportunities'). Venue: "Lunga House is a fine old Scottish Country House, originally a 16th century Tower House. Castellated, turreted and set on green lawns amidst tangled woodland. The house benefits from stunning views of the sea stretching from the Corryvreckan to Loch Melford encompassing the islands of Jura, Scarba, Luing, Shuna and beyond to the mountains of Mull." It overlooks Craobh Haven which is within reasonable walking distance. The Ballroom will be the scene of most sessions and the Saturday night banquet. There is a large dining room, two lounges and thirteen en suite bedrooms. We will have exclusive use of the entire facility during the SouthPole-sium. Because of size constraints the gathering will be limited to 100 attendees. For much more on Lunga click here. Also, have a look at Lunga's website. (One of the principles of the SouthPole-sium is that everyone attending pays the registration and no one attending gets paid to do so.) Two exceptions were made at the first SouthPole-sium to persons who contributed much in kind. One person will fall into this category in Scotland in return for services rendered. Both organizers/sponsors intend to pay the full fee. Full refunds will be given up to a week before the start of the SouthPole-sium; partial refunds—perhaps—after that. Registration: Registration commenced at the end of June 2014. Registration will be on a 'first come, first served' basis. If you're not on the list, and the number reaches 100, you'll probably be out-of-luck. Registration fees may be paid by US dollar and Sterling checks. Direct deposits in pounds may be made to a Royal Bank of Scotland account. Expected numbers: A minimum of 50, and up to but not exceeding 100. The smaller the number, the easier it will be to have meaningful discussion with a maximum involvement on the part of the participants. This will also simplify logistics, meals, etc. The preliminary budget with a contingency suggests that 75 attendees represents the break-even point and the goal is to break even. The organizers/sponsors will not profit from this. Honoraria, etc. : None. Registration, transportation and accommodation will be paid for by all participants. The only exception is one attendee who has had the registration waived in return for services rendered. Group Photograph: At some point during the weekend we'll set up a group photograph which will be placed on the website and will be downloadable. Also, it would be nice to have someone who is willing to take photographs throughout the SouthPole-sium. These will be place on the website as well. Any volunteer photographers? Cathy Cooper has volunteered. • For anyone arriving on Friday morning or earlier: a variety of setting-up tasks. • Registration and greeting attendees (Friday afternoon, Saturday morning.) Volunteers: Jackie Burton, Wendy Driver ("would love to help in any way"). • Audio-visual (help on computers and computer projectors). Kellie Gutman has volunteered ("I'm pretty good at solving technical problems so I'd be glad to lend a hand with computers, etc. My standing motto: 'Never let the computer sniff your fear!'"). So, too, Kevin Kenny ("I will make my questionable computer/projector/sound-system skills available, should they be of use!) He's too modest—Athy would jerk to a halt without Kevin! Trevor Potts has also volunteered: "I am used to setting up lap tops and projectors lecturing on Antarctic cruises and am willing to help set things up." He will also be bringing his computer projector. Bob Burton will also bring a computer projector. So that's two, now. He has also offered to bring his Kodak Carousel 35mm slide projector as well. Mike Tarver will also be bringing a Kodak Carousel, making two in all which should be enough. • Organizing and Moderating a multi-presenter session. Seamus Taaffe, Philip Sidney, possibly Paul Davies. • Photography (as indicated above) Volunteers: Cathy Cooper. • Videography. Tom Henderson did a great job putting together a video of the first SouthPole-sium but he's unable to join us in Scotland. Any volunteers to at least take the video. Editing can always be done by others. • Keeping an eye on the Book Room where things will be for sale and recording sales. Kellie Gutman has volunteered. Also Philip Sidney. • Music. Will we have any musicians amongst us (particularly Scottish)? David Hirzel e-mails: "I'll try to prepare to lead the group in one or more songs from "Songs of the Morning" and possibly other sea songs specifically referred to in the various accounts of Scott's and Shackleton's expeditions. I've been doing this sort of thing with the Hyde Street Living History Players (San Francisco Maritime National Historical Park) for about 20 years." Paul Davies e-mails: "I can bring along a CD of the Yelcho Trio who played at Plymouth with the words of Frankie Wild-o." All will receive a Keepsake that includes the words to Our Home on Elephant Isle. • And speaking of music. A volunteer bagpiper would be nice to have, both Friday at the reception and leading up to the Banquet. Speaking of bagpipes, listen to this (recorded at the Shackleton 100 event last August). Reception commencing at 6:00/18:00 at Lunga House outside—weather permitting—or inside if not. Opening of the SouthPole-sium at 7:00/19:00. The Opening will be followed by a barbecue. 9:00 Welcome by the sponsors. 'Housekeeping' items. Roundtable: Attendees introduce themselves and their interests extensively (throughout morning). Followed—if time—by start of short presentations, book launch(es). 1:30/13:30 Afternoon. Expanded talk (up to 40 minutes) on Scotland in the Antarctic by Bob Headland. Followed by short presentations (up to 15 minutes) through the end of the day, some moderated. 6:00/18:00 Evening. Reception followed by the Banquet, concluding with a variety of tom foolery and entertainment. Short after-dinner talk by Bob Burton The Strange and Awful History of Scurvy. Perhaps a short auction (see below). 9:30 Continuation of Saturday's short presentations and discussions including one or more moderated sessions. Book launch(es). 1:30/13:30 Continuation of short presentations and discussions including one or more moderated sessions. Book launch(es). Perhaps a short excursion of some sort near the end of the day. House/Garden Party at Jane and Falcon's Loch Shuna House. And if that's not enough then drinks and something to eat at The Lord of the Isles pub down in the village (cost not included in registration). 9:30 Continuation of Sunday's short presentations and discussions including one or more moderated sessions. 12:30 Lunch. Sandwiches, etc., followed by wrap-up discussions and farewells. The SouthPole-sium will formally adjourn by 3:00/15:00, though many attendees will still be present and can do as they please. NOTE: We will strive to keep talks to 15 minutes. This was a challenge at the first SouthPole-sium. There will be one longer talk by Bob Headland as noted above. Displays/Exhibits: Some of the booksellers and publishers attending the SouthPole-sium may wish to set up modest stalls of books for sale. And attendees are invited to bring duplicates for sale or trade. (See Auctions below.) Tables will be provided if needed. A separate lockable room at Lunga House will be made available for this. Those wishing to bring art, photographs, etc., (theirs or others) for display and/or sale are encouraged to do so. But let us know ahead of time so that space can be made available. At the moment the following will be bringing books to sell: Kingsbridge Books (Paul Davies), Maggs Bros., Adelie Books (Michael Rosove), Seamus Taaffe, Rob Stephenson. Auction: An Antarctic book and artifact auction will be held. Items may be donated by attendees with the proceeds going to support the costs of the SouthPole-sium, or to the donor or a 50-50 split. Our auctioneer: John Bonham, ably assisted by Anne Strathie. An offer has just come in from Wendy Driver: "I have just been given a bottle of cognac in an oak box from one of my journalist friends. It is from MS Fram, launched in 2008 and named after the original ship. 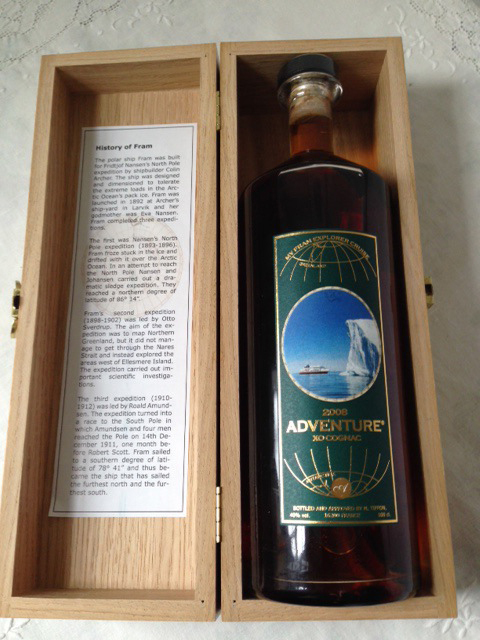 The Cognac is made from ice water taken from the Antarctic and Arctic Oceans and thought I might bring it up to auction (except it weighs a ton!). However I would like the proceeds to go to the Antarctic Heritage Trust and would want to put a reserve price of £60 on it." Perhaps the winning bidder would give each of us a taste! Some of those items that will be auctioned are shown here. Dress: The SouthPole-sium will be informal so no need to pack jackets or party dresses, unless you want to. That said, some may wish to be a little dressier for the Banquet. Of course, if you have a kilt or other Scottish apparel, bring it along! Presentation Files: Any attendee who plans to project anything on a screen (PowerPoint, Keynote, images, etc.) should, if possible, get the file(s) to us prior to the gathering. This should minimize glitches. If you are bringing your own laptop be certain that you have the correct connectors and dongles. If you bring files on a CD, DVD, or thumbdrive, make certain that they can be accessed and shown on a Macintosh Air using OSX 10.10. We expect that we will have a Windows laptop available as well. WiFi: Lunga House—our venue—has WiFi in the public areas. NOTE: The rooms and cottages at Lunga House and at the pub in Craobh Haven are now fully booked by those attending the SouthPole-sium. You still might check, though, as cancellations have occurred and they are maintaining a waiting list. Links to other local accommodation may be found here. Facebook: Yes, we've succumbed. We have a Facebook page on which we'll be posting news from time-to-time. And now we have a "closed group" page on Facebook specifically on the SouthPole-sium. This will give attendees an opportunity to post questions to many of those who will be attending, questions related to sharing accommodation, rental cars, taxis, etc. You will have to have a Facebook account to join the group. Moderated Sessions: At the first SouthPole-sium, a moderated session kind of materialized on its own. David Stam was the one who got it going. The focus: "What to do with your collection when you're on the way out?" Give it to an institution? Sell it? Consign it to auction? And so on. We had some spirited discussions. What moderated sessions might work this time around? The state of Antarctic book collecting today? Books yet to be written? Works-in-progress? Scotland in the Antarctic? Have a look at Subject Ideas for Talks that might be Presented and Subjects of Talks proposed to be Presented so Far. What do you think? Book Launch(es): If possible, one or more books will be launched (or otherwise presented) at the SouthPole-sium with the author(s) talking briefly about their work and selling/signing copies. Let us know if you have a book to launch or highlight. David Hirzel e-mails: "I'm planning on a book launch … of my Antarctic Voyager: Tom Crean with Scott's Discovery Expedition 1901-1904 and will have copies on hand for sale. CONTESTS—valuable prizes for the winners! Must be attending to submit. How are we going to judge the entries? Each attendee will have in their Conference Pack four labelled ballots: HAIKU, LIMERICK, FICTION, PENGUIN. There will be a ballot box in Lunga House. All the entries will be on display or you can go online to see them. Deadline for submissions: 2 pm, Saturday, 2 May. Haiku Contest: Have you ever come upon an Antarctic haiku? Give it a try. [Haiku = Japanese poem of seventeen syllables, in three lines of five, seven, and five, traditionally evoking images of the natural world.] All entries will go on the website. Those submitted at the first SouthPole-sium were pretty dreadful. I hope they're better this time around. Start sending them in anytime. 15 Entries Received so far. Limerick Contest: too. Bawdy or otherwise. 4 Entries Received so far. Fiction Contest: Write up to 600 words beginning with this: "It was Scott's 43rd birthday which called for a celebration. The Cape Evans hut was festooned with sledge flags and the table was spread with enticing food and drink. Ted Wilson leaned over to Scott and whispered in his ear…" Serious. Comical. Whatever. 2 Entries Received so far. Penguin Contest: Produce anything about a penguin or penguins. Cartoon, joke, poem, one-page short story. 15 Entries Received so far. Favorite Photos: Pick up to three of your favorite or most interesting Antarctic and/or book photos and we'll project them for your explanation and comment. E-mail the images ahead of time. This might be done at the Banquet or perhaps we'll have a continuous loop set up on a laptop somewhere. 12 Entries Received so far. The Banquet Quiz: The subject will be Scotland and the Antarctic. Tables will compete against one another. Glasgow Airport to Craobh Haven: 97 miles, 2 hours 13 minutes. Edinburgh to Craobh Haven: 136 miles, 3 hour 19 minutes. Craobh Haven to Dundee: 132 miles, 3 hours 16 minutes. There is RAIL SERVICE from Glasgow Queen Street to Oban which is about 20 miles north of Craobh Haven, from where you can take a TAXI one possibility being Oban Taxies (+44 1631 563784), (estimated cost £35-40), bus or arrange a pick up. With some foreknowledge, though, some car pooling might be arranged for those driving from the south or for those flying into Glasgow or Edinburgh. A section at the top of the website ("Logistics & Sharing") has been added for those who want to enquire about transport and sharing of accommodation. If several or more attendees are arriving on the same train in Oban on Friday—and we knew that ahead of time—we could probably arrange some cars to shuttle people to Craobh Haven. Things to do Before, During & After: Craobh Haven is in a lovely part of Scotland and there are plenty of sites, sights and attractions to visit before, during or after the SouthPole-sium: Museums, Castles, Canals, Antiquities, Boat trips, Fishing, Gardens, Walks, Riding, Clay pigeon shooting, et al. We have bookings for catered dinners in the Wardroom of Scott's Discovery in Dundee. The dates are: Monday 4 May and/or Tuesday 5 May. The Tuesday option is now filled but there still is space on Monday night. Click here for further details.